Hand stuttering technique (or method because it's much more than just a technique) is the technique I used myself, and that's the technique I'm preaching about in every single video of mine. I absolutely love it. Because I see it working. Now, what is it and how is it working? Let's find out. Stuttering is much bigger than just the speech impediments. The impediments are just the top of the iceberg. Underneath, often unseen, there's a huge body of the iceberg holding the fear of stuttering, desire to hide it and avoidance behaviors. The hand stuttering technique aims to affect all of those and that actually makes it so powerful. Let's start with the top of the iceberg, the speech impediments. That's something very obvious to us. And we often see our stuttering as speech impediments and measure our speaking in terms of fluency or disfluency. I want you to imagine a speaking situation as a fast river and our speaking as getting to the other side of the river. We want to get to the other side of the river, but once we get to the water we're just taken away by the flow. We don't get to the other side as anticipated. Or we greatly drift away with the flow and get to a very different point on the other bank of the river. Exactly the same thing happens to our speaking. We're carried away and we feel helpless. Even if we've done many speaking exercises at home or in the therapy classroom. In this setting, it's really hard to stop the moment and do all of that you've learned in the classroom. What our speaking is missing is the inner structure, inner frame. That's what the hand technique brings, first of all, it brings the inner structure, the frame for our speaking. We use our hand to serve as a support for our speaking. We learn how to relax, how to launches the phrase in a relaxing and powerful way. Once we've launched it confidently we put the power to the stresses relaxing on them as well. We get a relaxing, powerful and expressive speaking and put it on a solid foundation. Basically, we just restore the natural way of our speaking, the natural way of being expressive because you choose where to put the stress. You choose how to put the stress. You draw the intonational and dynamic picture of your speaking. 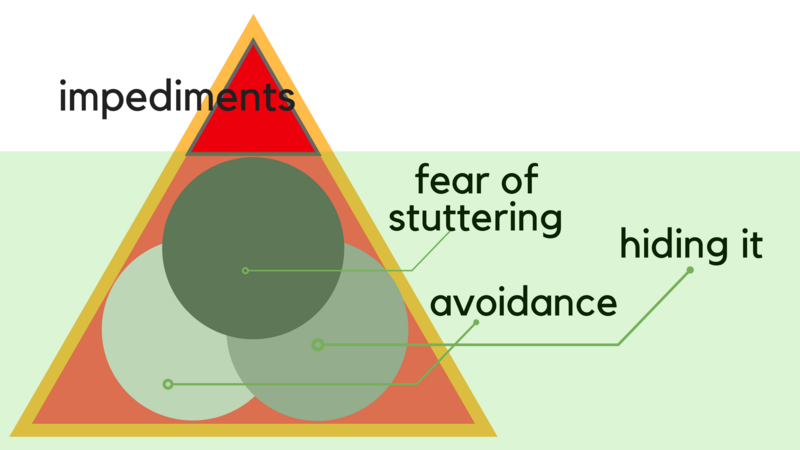 Stuttering is much bigger than just the speech impediments. When we try to reach fluency without addressing the body of the stuttering iceberg it's like cutting the leaves and not touching the roots. So, what can we do with fear of stuttering, desire to hide it and avoidance behaviors? As we nail the technique we want to apply it. And we need to go through this uneasy moment where we realize that our training speech using hand is a bit different to our "regular" or "normal" fast and choppy speaking. We believe that this fast and choppy speaking is the norm. When we get confident, relaxing, powerful, expressive we feel a bit uneasy. We want to be just NORMAL. And that's the core moment we want to get through. That's the moment when we feel uneasy about being self. Being YOU. Going from "I want to be NORMAL" to "I want to be ME." I don't want to be ME. I want to be NORMAL. That's the essence of that struggle we're going through. And going through that struggle is actually getting free from stuttering. Not the speech exercises. Not the fluency stuff. With the hand stuttering technique, we start speaking on our terms. We start to lead. Our stuttering state turns upside down. We get a totally different feeling. The feeling of control and confidence. We start changing that line of code in our program that says, "No matter what, I'll stutter at some point" to "No matter what, I'll get back to my relaxing, confident and expressive speaking." Again, it's not about fluency. Fluency can come and go. Fluency depends on the speaking setting. We want to replace that "fluency game" with another one where you create, where you lead, where you truly feel free of the whole stuttering iceberg, not only the speech impediment but the fear of stuttering, the desire to hide it and avoidance behaviors. You want to get free from the whole thing. Leave a comment - would love to know what you think!